When a stand-up comedian and her husband bought an Italianate townhouse in Chicago’s Lincoln Park neighborhood, their idea was to retain the structure’s original character while inserting their own personalities. 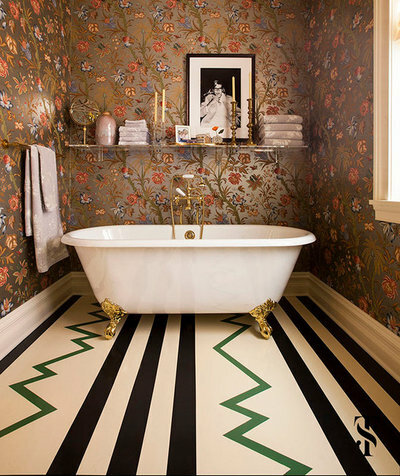 Fans of Wes Anderson movies, in particular The Royal Tenenbaums, the couple enlisted help from designer Summer Thornton to achieve a similarly bold and eclectic look. 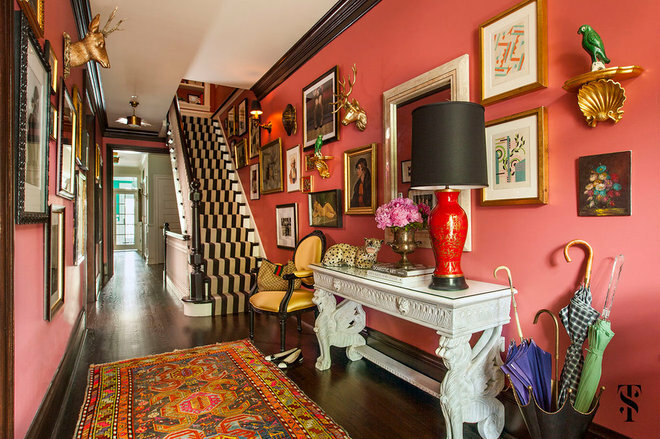 Coral pink walls, a Persian rug, a striped staircase runner and an art-filled gallery wall boldly greet visitors in the home’s spacious foyer. “The wife is super laid-back and trusting — she doesn’t take herself or design too seriously —which allowed us to have a lot of fun and create a space that is cool and daring, just like her,” Thornton says. 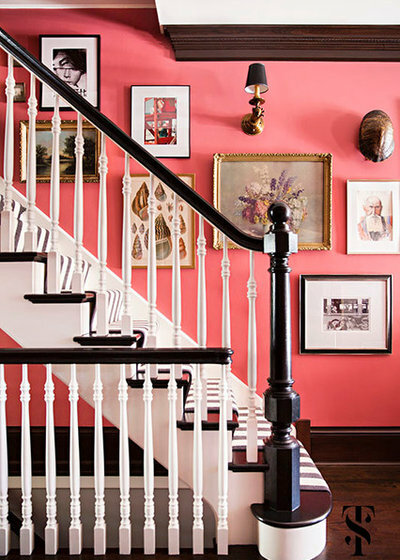 The foyer’s array of colors, styles and decor, from vintage to traditional to contemporary, establishes the home’s vibrant personality from the get-go. 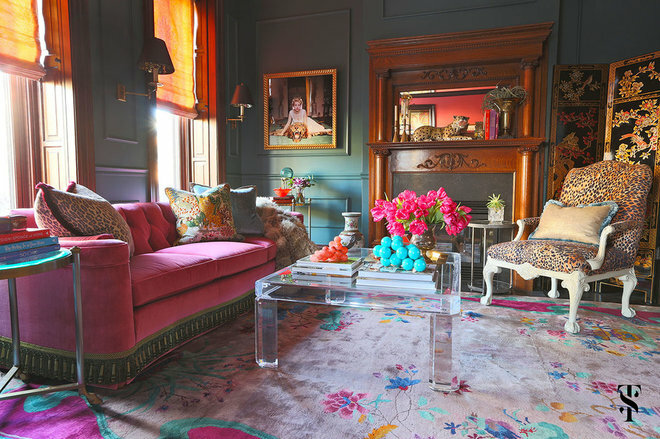 In the living room, a pink velvet sofa pops against dark teal walls with traditional millwork. The Lucite coffee table adds a modern touch and offsets the traditional heavy mantel. 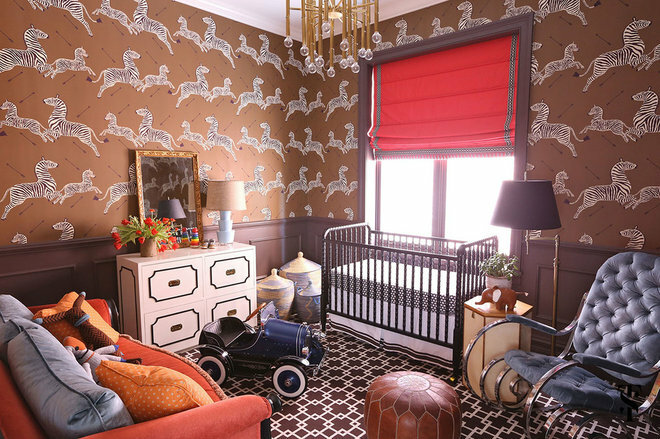 Animal prints, plush accent pillows and a soft area rug make the room anything but stuffy. “With Wes Anderson films, there’s something about the palette that always stands out — his films never look like a typical film — so we wanted this home to have a palette that similarly was unexpected and atypical of most homes,” Thornton says. This colorful ottoman in the family room reflects that idea. 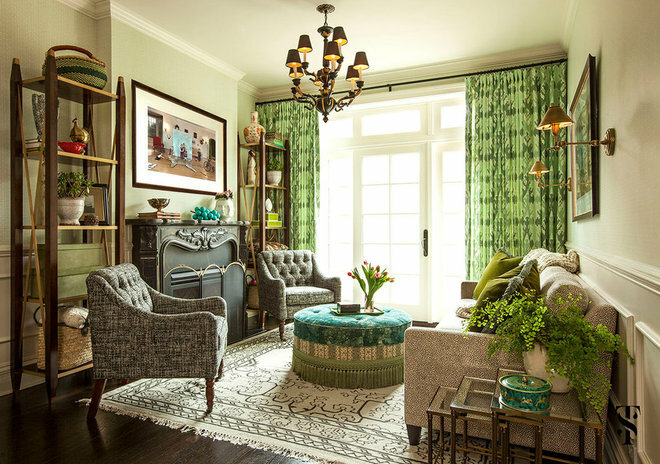 Draperies with a bold graphic pattern dress one wall and tie together the other green accents in the room. 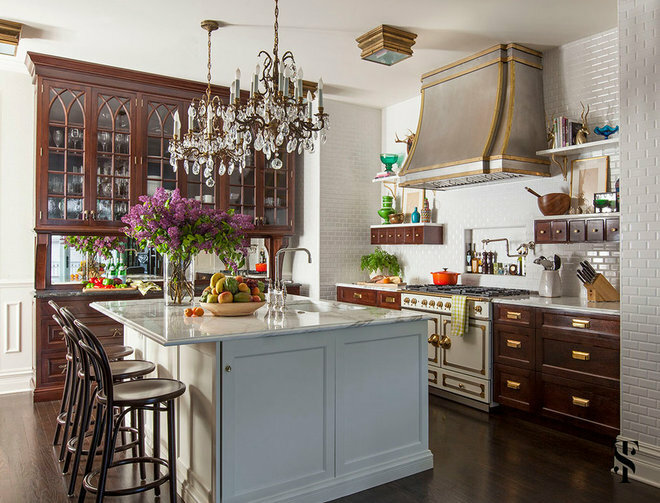 Thornton and her clients wanted the kitchen to feel as if it had “been there since the house was built in the 1890s,” the designer says. She designed the built-in buffet with arches that replicate the original millwork and stained it walnut. 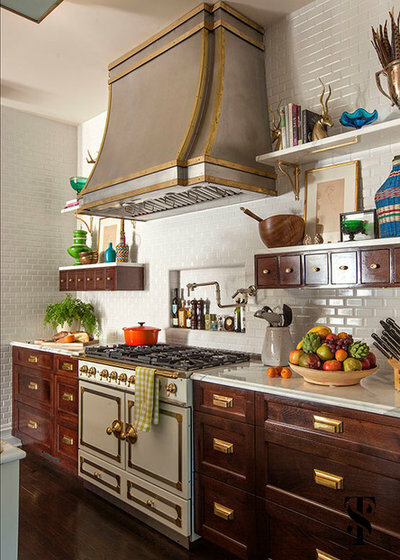 For the cabinets, she used a dark warm hazelnut color common in old homes. A white kitchen island with a built-in wine refrigerator keeps the space bright. Antique chandeliers and Thonet stools add to the vintage vibe. Thornton added vintage lighting and a La Cornue French range for a more classic feel. The hood was custom-fabricated by Bladon Connor, a partner at Aaron Bladon. White subway tile on the walls also adds a fresh aspect to the kitchen. 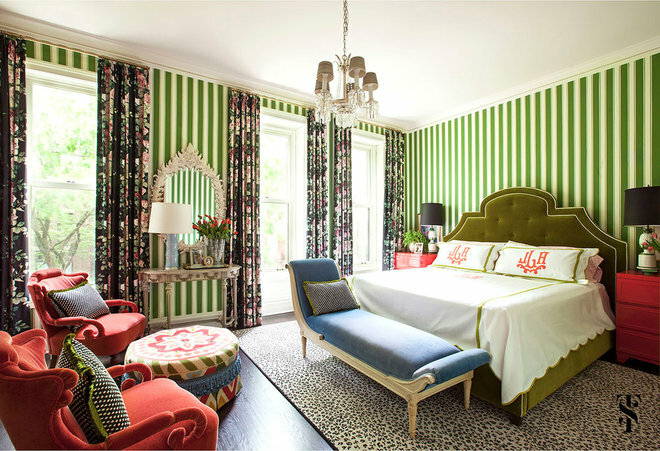 In the master bedroom, walls painted in green stripes are interrupted by floor-to-ceiling windows with dark floral draperies. A cheetah-print rug provides the perfect base for the green upholstered bed and blue velvet chaise. The bed is flanked by two coral lacquered tables that are mirrored across the room by a set of coral chairs. 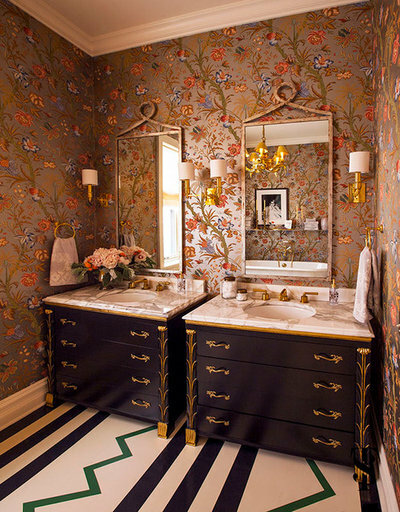 Thornton created a different world in the master bath, which features metallic-backed floral wallpaper, traditional moldings and a graphic-patterned floor. The master bedroom’s walk-in closet is enlivened by blush-colored cabinets, wall-to-wall cheetah print carpet and graphic pink wallpaper. “It’s a little slice of heaven on even the worst mornings,” Thornton says. 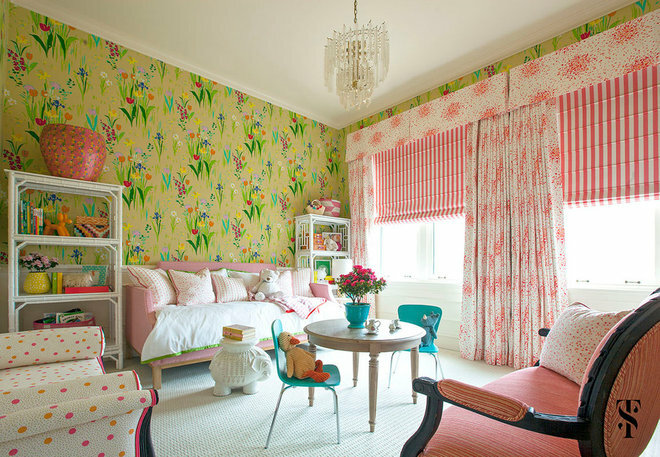 The daughter’s pink and green bedroom features a tulip wallpaper and draperies with striped Roman shades. “I’m a maximalist,” Thornton says. “Pattern and pattern excites me.” The daybed offers plenty of space for tea parties, while open shelving holds books, toys and treasures.